Interested in being part of the National Premier League teams for NCF? Register via the following link, attend the appropriate Trials and see if you have what it takes to play the Best Football Players in Northern NSW. TRIALS START NEXT WEEK, SO DO NOT WAIT, DO IT NOW! What is NPL and what does it entail? Annus horribilus, the only way Grafton United will remember season 2017. Winless in all starts and it didn’t get any better this past week as the Raiders in a catch up game on Wednesday night at Rushforth Park pumped in 16 unanswered goals and followed that up with an eyewatering 12 last Sunday at the Cabbage Patch, Ben Dooley and Fabrice Wamara both featuring heavily on the scoresheet. Not the best warm up for the final series for Paul Pomroy’s men though. 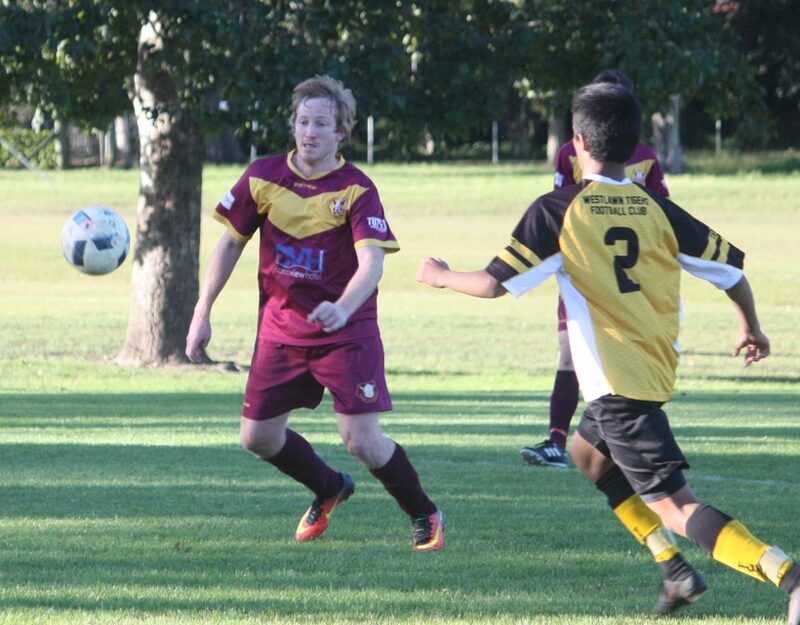 Their opposition in the semifinal, Boambee FC, may not have been tested fully either as they played the other Grafton side who are only a few points higher than zero on the ladder. The semis though should provide a higher level of competition for spectators, in a home and away format where away goals are worth 2 it will be very interesting indeed at Ayreshire Park this weekend as the Bombers try to do what they have been unable to do to this point ie beat the Raiders. 5-1 and 2-0 in the previous encounters through the season would seem to favour the Raiders but at Areodrome of Ayreshire Park who knows. In other results the Raiders reserve grade had 9-0 and 7-1 wins over Grafton and will play Sawtell in their first semi that game likely to be at Toormina on Saturday. The women’s first grade also a stirring 1-0 win at the Cabbage Patch over Woolgoolga, Kelsie Williamson-Leslie the hero with a second half screamer from a thousand yards! Bre Martin and Belinda Moore both key players in that victory. 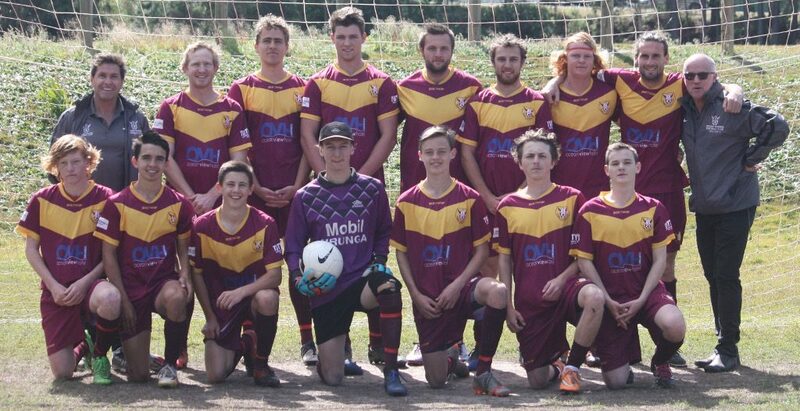 They will take on the Boambee Eagles at the Cabbage Patch this Saturday and that promises to be a great contest. Go you Raiders! 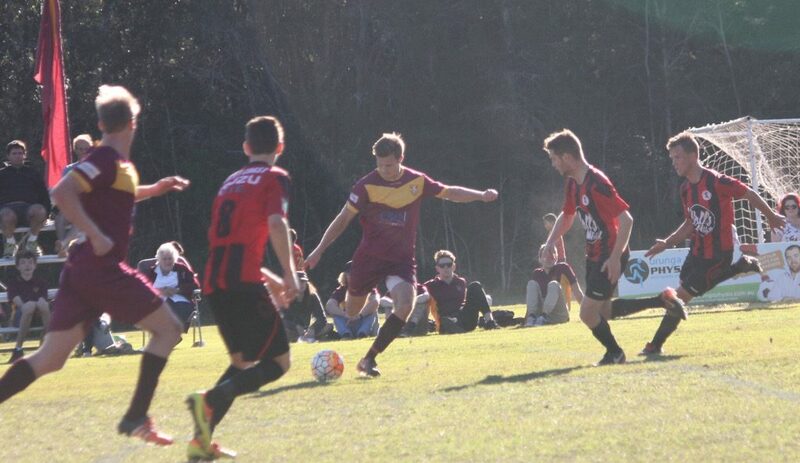 It was 1 nil disappointment for the Raiders last weekend at Wherrett Park V MacLean Bobcats, the win boosting the Bobcats chances of playing football in September and the loss extinguishing the Raiders hopes of gathering a minor premiership which now looks set to go to the Coffs Lions. Didn’t look that way at the start though, the Raiders under beautiful almost spring like skies looked rock solid. Tanjil Everrett, Harry Gale, Jake Leslie and Mick McCormick the Raiders back four hardly troubled by the infrequent Bobcat attacks that lacked a certain cohesiveness or direction with the odd angry shot collected by Urunga’s keeper Lee Kennedy and punted back up field or fed to one of the back four defenders. It looked controlled and under control, yet the Raiders unable to score in the first 45 plenty of possession, slick play but not incisive enough to unlock the Cats defence led by the veteran Gary Carmicheal. The Raiders sans a number of key players for this one not helping matters either, Fabrice Wamara, Ben Dooley, Jaxen Heward or Craig Simpson out for various reasons and although the assassin aka Tim Ruprecth went close a couple of times the Cats kept their goal intact and themselves right in the contest. Raiders coach Paul Pomroy might have doubted a favourable outcome shortly after the start of the second half. Ruprecth’s right side surge caught the Cats defenders out, his cross to the ginger bread man Mr Jai Waddick looked destined for the onion bag but Brad Corbet for the Cats in a Cirque du Soliel type move flicked the ball out, even now I don’t know how it didn’t go in. Minutes later after a goal mouth shemozzle Waddick again denied by the lightening reflexes of Alex Moffit the Maclean keeper, shot from inside the 6 yard box punched out somehow by Moffit’s right mauler, I mean he could try another 10 times and not get it right but there you have it. Maclean started to believe they might at least draw and get a valuable point from the Premier League heavyweights and with the clock ticking they scrambled for everything buoyed by a crowd that was solidly green and white and would only ever considered a Maclean victory as a good day out. A free kick is awarded by referee Bruce Mackie for hand ball in the shadows of fulltime, the wall is set and Maclean’s Jarod Doyle shot defects off the wall falling for recently introduced substitute Mackenzie Allen to slap in like he was throwing a scotchie on the barbie. Not much Kennedy could do about it either he’d already moved one way to block the Doyle strike and Allen’s shot went the other, 2 minutes left and the Raiders needed a miracle which would not be bestowed on this occasion delivering a 1-0 score line. In the earlier match the Raiders Reserve Grade had a close 1-0 win, the goal engineered by Ben Dooley and scored by the effervescent Josh McGovern in the second half. The win delivers the minor premiership to the Raiders the second such accolade in as many years. The Raiders will play Grafton this weekend at the Cabbage Patch in the final round of 2017 and will finish second on the competition ladder, then the final series and with third and fourth spots still up for grabs it should be an interesting round. The Raiders family fun day, face painting, half-time football from junior little people, soccer golf and a thousand yards of sunshine oh yeah the Cabbage Patch that’s where you needed to be last weekend. It was first V second and in any code it brings a flavor that’s had to deny. The Raiders in second place looking to usurp the Lions seemingly eternal position atop the Premier league table and few rounds left to make that happen. Last time they met it was a 1-1 heartbreak for the Raiders at Maclean street, the Lions a tad lucky to get out of that one, an Aaron Allsop goal from a free kick angling in out of the sun deep in the second half the equalizer. At the Cabbage Patch though it’s not so easy, head coach Paul Pomroy looking at a fresh lineup for the Raiders no Hopper, Gale, Mac Daddy or Dooley for this one, some would say we were a tad thin and this scribe would agree. Dave Connor the man in charge and the Lions sliding around the Cabbage Patch like it was their own in the early stages Dut Garang testing the Raiders keeper Lee Kennedy on 12 minutes with Kennedy parrying the shot for a corner. The Raiders stretched on more than one occasion in this half and Kennedy the hero as the visitors looked for an early lead but it would be the Raiders via a bulldozing Lockie Indian Manning run that set up the first goal. Lockie scrapped for the ball midfield and with no apparent plan herded by Lions defenders speared upfield. Lions main defender Ike Turner managed to get a foot onto the ball and end the run but the ball spilled to Tim Ruprecth. He’s had a great year for the Raiders has Ruprecth, a striker with the qualities of an assassin and with the Coffs goal in his sights put the Raiders 1 up on 22 minutes. The strike well received by the large parochial home crowd I can tell you and I’m not talking about polite applause either but the lead short lived, the Lions straight back onto the attack testing the cohesiveness of a Raider defensive line that at times looked somewhat ragged. The equalizer a piece of practiced play that would put a smile on any coaches face certainly Coffs coach Glenn Williams delighted as the free kick move delivered just outside the Raiders area found the inside post and this time too good for a diving Lee Kennedy to give a 1-1 scoreline. The break 15 minutes away the Lions in top gear now, Everrett, McCormick, Leslie and Heward working hard for the Raiders to blunt the constant attacks and no doubt Pomroy wishing they were in the sheds for plan B, but fasten your seat belts the next 15 m produced two goals. The first via a quick thinking Craig ‘turtle’ Simpson free kick delivered outside the Lions penalty area and before the Lions could organize their defensive line the turtle slipped the ball to Ruprecth who was already in forward motion, he chipped the ball to Indian Manning who converted for 2-1 on 41 minutes. If that wasn’t enough and in the shadows of half time perhaps the next goal was. The goal engineered by the Lions dismal defending caught askew by a pressing Raider side that could scent another opportunity mmm and the Lions defenders not accurate enough or clear enough in what they should do, anyhow Fabrice Wamara knew what he should do, plunder the indecision and so a careless back pass not hit with enough weight intercepted by an alert Wamara who was simply too good for the Coffs keeper. So 3-1 at the break and perhaps plan B back in the folder for coach Pomroy. The Lions without Ike Turner (hamstring) for the second 45, he’d saved them a few times in the first half once literally off the line and the Raiders began like spring chickens (spring chickens run really quick) Sharp attack and pressing the Lions whenever the ball was turned over, the turtle orchestrating more than one forward foray linking nicely with Waddick on the Raiders right flank. Wamara picked up his brace 11 minutes into the half catching Aaron Allsop off-balance and skating toward the Coffs goal delivering the coup de grace and collecting his brace for the afternoon. So 4-1 and we’re getting into embarrassing territory now for the pride and they were under a barrage of Urunga attack that was as unrelenting as it was enthusiastic. The Lions gathered somewhat though and defended well in those last 25 minutes. 4-1 to the Raiders the final score and coach Pomroy lauding the efforts of his adjusted side positive signs indeed for the upcoming final series where it will be likely the sides will meet again and what a match that will be! In other results a Nick O’Mullane goal enough to get the Raiders reserve grade home in a tight curtain raiser 1-0 in that one, the women travelled to Maclean for a 2-2 draw still eying off a finals berth as well. Go you Raiders! The Dingo, canis lupus, a wily creature an adept predator and survivor, closer to a wolf than a dog but they didn’t survive the onslaught that the Urunga Raiders bought to the table in round 13 of the North Coast Premier League Football competition. Raiders coach Paul Pomroy had the Raiders at the home side from the first blast of Dave Connor’s fox four whistle. Jai Waddick leading the charge constantly pressing Orara Valley’s defensive line giving the home side little or no time to control proceedings. The pitch didn’t help either, the clay subsurface had congealed to a concrete like consistency testing the ball control of the some of the best players on the midnorth coast. Ben Dooley opened the scoring for Urunga, he’d scrapped had Dooley like a dog at a barbeque perhaps scenting an opportunity as Asama Radford skated down the Raiders left flank. Radford’s cross glanced off Jamie Arthur’s prodigious frame and by the grace of the football gods fell close to Dooley. Still some work to do for Dooley though as the Orara defense closed but the strike was as unerring as the stare of the Night King (the bad man in Game of Thrones) and the Raiders 1 to the good. Fabrice Wamara extended that lead on 33 minutes fed a delicious ball from Kale Hopper slicing between defenders the ball enticing the Dingo’s keeper Josh Harrigan out of his den into that place where no keeper wants to be halfway to the ball and advancing striker, he might have got there too but Wamara is quick and already in motion his deft chip had the Raiders 2 up at the break. Probably the closest the Valley side got was after Jacob Riles-Hills bounced his shot off the Raiders goal only minutes into the second half. Hit with plenty of power the shot looked good and an inch to the left might have been but not today. Urunga holding possession for longer periods now, Craig ‘turtle’ Simpson the architect of many of Orara’s problems steering the Raiders around shifting the focus of attack or equally slowing the pace of attack. The turtle threaded a raking pass over the Dingoes defensive line midway through the second half, Wamara fastest to act getting his body between the ball and the Dingo’s Jamie Arthur. On goal now and Arthur’s miss timed tackle bought down the Raiders striker inside the Dingo’s penalty area as Wamara was about to release, Dave Connor ignoring howls of protest points to the spot and Simpson sends Harrington the wrong way to produce a final 3-0 score line. Injury to Ben Dooley perhaps the only disappointment for Raiders coach Paul Pomroy on the day as his side bounced back to some form after a lack luster match V Storm. Not much time to recover either as they face Coffs Coast Tigers Wednesday night (26/7) at Polworth Drive in a catch up match kickoff set for a bracing 8pm reserve grade at 6. 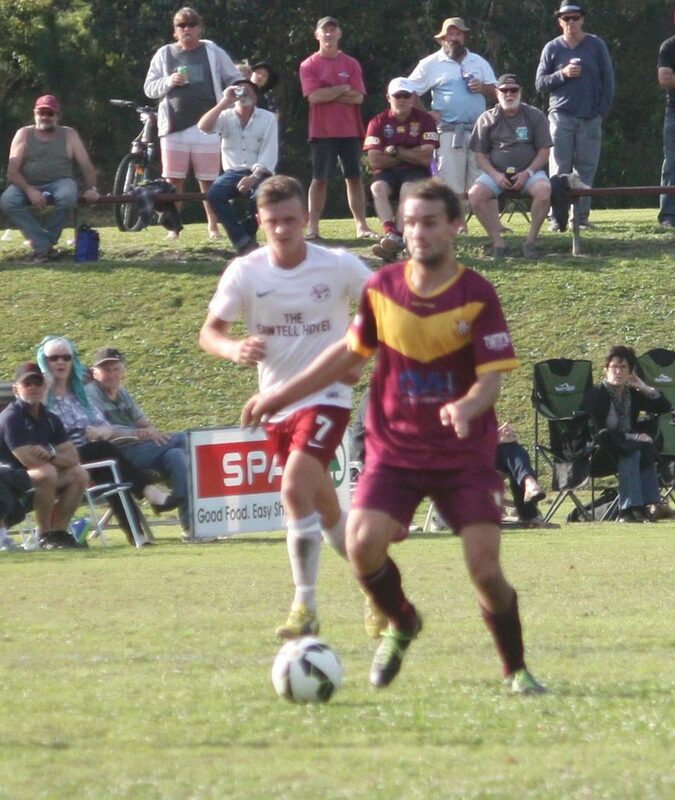 In other results the Raiders reserve grade 3-0 winners, a brace for Grant Homes and 1 to Thomas T Rixon, the women’s first grade 5-2 winners over Coffs Lions while the reserve grade went down 4-0. Go you Raiders! Northern Storm’s Scott Tarlington broke a few hearts last weekend at the Cabbage Patch, his last gasp equaliser stole the Raiders sunshine leveling the scores at 1-1 and not enough time left for the Raiders to do much about it. On the back of some desperate attacking from Jamie Kennedy, who’d been a thorn in the Raiders side all afternoon, Tarlington whipped his shot past Raiders Lee Kennedy from close range in the 84th minute gathering a goal, a share of the points and definitely the upset of the round for the Storm. It didn’t quite look as clear cut after the first half though, the stuttering Raider attack began to look more fluid as the half progressed, crosses were taunting the Storm’s keeper Marcus Woschitzka. 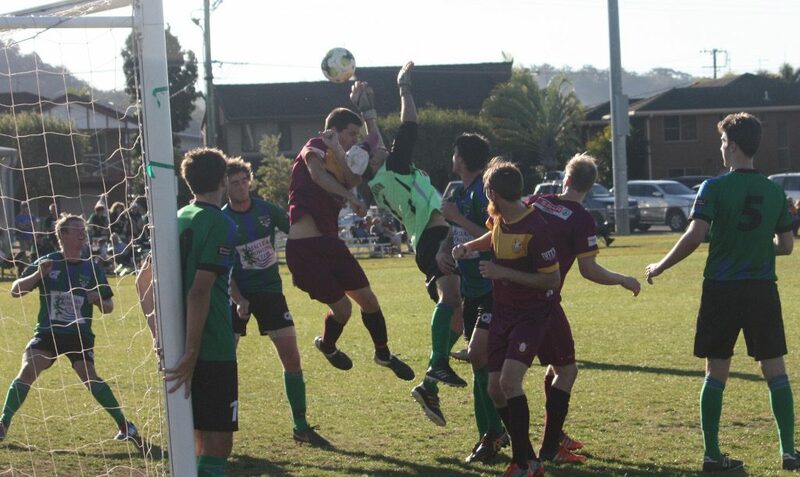 After Craig Simpson bounced his header of the cross bar Urunga struck home via the ginger bread man Jai Waddick. Asama Radford had fired in a low cross in the shadows of halftime and Waddick hit it into the net like he was teeing off on the first at Royal Urunga hoping to hit the green on the drive! (it’s a big hit) Fabrice Wamara might’ve had the sides in the sheds with Urunga 2 up had his aim been a tad lower shortly thereafter not to be though and at 1-0 the 8th placed Storm were absolutely still in it. There were plenty of opportunities for the Raiders to put this one to bed but they just couldn’t find the correct sequence of passes, perhaps missing the silky touch of Tim Rupprecht who was on an urgent modelling assignment. Credit too to Storm’s head of defence Nathan Parkins stepping into some big shoes with Nathan Skinner sidelined with a hamstring bingle, Parkins tipping the scales at well above the 100 kilo mark was solid as a rock for the visitors. The final result of 1-1 on a day where the two clubs celebrate the memory of Rachel and Dixie Erlandsen who so tragically lost their lives in 2015. Dixie then president of the Urunga Raiders would also be seen working with the Northern Storm in the canteen or wherever she was needed which I think is the essence of the game to help and not hinder. In other results the Raiders reserve grade fought back from 2 down to win 3-2 Cale Hopper a hat trick. The Urunga women’s first grade dominated Orara Valley 12-2 goals to most of the team in that one. This weekend the Raiders will at Dairyville V Orara Valley on Saturday at 4pm, bring a jumper and a camera- the sunsets there are awesome. It should’ve been played much earlier this season but an east coast low spiraling in from the great southern oceans put paid to that so here we are, or were, mid-week at Urunga’s famous Cabbage Patch for a real test of metal fourth placed Orara Valley Dingoes v Urunga Raiders sitting in equal first or a poofteenth away from it courtesy of goal difference to Coffs Lions and that because the Lions have played the feckless Grafton United and whacked in an eye watering 28 unanswered goals in two outings while the Raiders have yet to play them. The Dingoes went down last start to a voracious Coffs Tigers outfit 5-2 and had 3 players sent off in that bloodbath, that dose was about to be repeated at The Cabbage Patch as the Raiders jumped out of the gates hungrier than a bunch of kids at Maccas. Fabrice Wamara and Tim Ruprecht both scoring inside the opening 15 minutes at the end of training like moves both side foot and both past an unravelling Dingo defence. Asama Radford followed that up with one more after boning one defender and slotting number three. So the Dingoes three down inside 30 minutes, it was all too much for Orara’s Dylan Louden carded for a rash challenge Louden’s petulant response to ridicule referee Bruce Mackie rightly earnt him a subsequent red card and the struggling Dingoes down to ten men. The Orara side gathered at the break and played a better brand of football in the second half scoring twice once from the spot, the second a well-placed shot from range but the Raiders always had their measure and by that time it was out of reach at 5-0. Tanjil Everett who wandered up field for a corner timed his run to perfection and nodded in the Raiders fourth while Tim Ruprecth gathered his brace and the Urunga’s fifth. So a final score of 5-2 and a smiling coach Paul Pomroy pleased with the sides performance particularly their discipline. In the earlier match the Raiders also successful 4-3 Joe Pettit 3 goals and Josh McGovern 1 in an interesting curtain raiser. 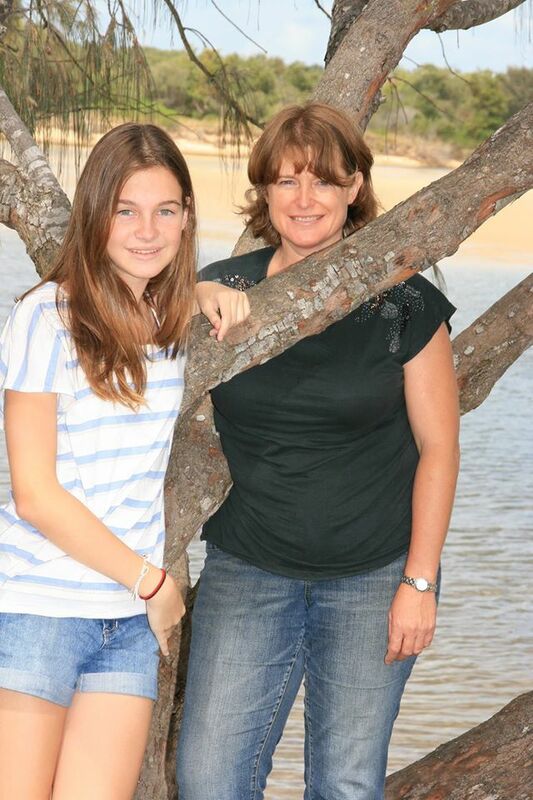 In honour of Rachel and Dixie, lost to the football community in November 2015, Urunga Raiders and Northern Storm will dedicate this round of the competition to the Erlandsens by playing for the Memorial Shield. On Sunday the 16th July, the Men’s Premier League and Reserve Grade teams will play for the right to take out the Dixie and Rachel Erlandsen Memorial Shield. This is an annual event between the Clubs to honour their club members. Come and join us as we remember two very special people. 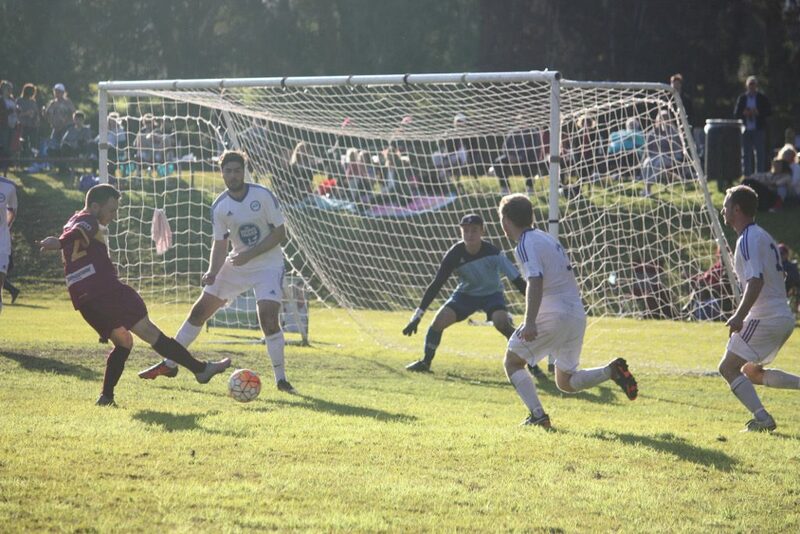 The waxing gibbous moon rising over Barnier Park last weekend did little to ameliorate the players comfort as they faced off for round 11 of the North Coast Premier League Football competition. At a nut tightening 8.10 C spectators were few and far between I can report a bit sad really because but the football was a credit to both teams. The Tigers defended with resolve of a side that has seen victory only twice in 2017 and it would 29 minutes before the Raiders netted the first of the night via the right foot of Fabrice Wamara and that from close range. Wamara followed that up with a well-timed header at the end of fast Raider attack to have the sides in the sheds the Raiders a handy 2-0 lead. On the back of about 80 percent possession the Urunga side might’ve expected a more convincing score line and certainly against some other sides it would’ve been. The Tigers hit back at the start of the second half to have the scores at 2-1, not in the Raider’s coach Paul Pomroy’s plan at all. Just a good individual effort from Jordan Newman who can run like the wind blows his shot ricocheting off the far post into the Raider’s net look they just couldn’t catch the fleet footed Newman. It would be the closest the Tigers could get though as Fabrice Wamara gathered his hat trick 25 minutes from full time, Tim Ruprecht added another for 4-1 but the goal of the match goes to Jake Leslie. Gathering the ball in his own half Leslie darted inside one defender the ball sitting up nicely for him to hit a speculator that dipped into the Tigers net for 5-1 a strike Leslie will savor for some time. A solid result against an improving side for the Raiders who won’t have much time to dwell on that win as they will play a midweek catch up game V the table topping Orara Valley Dingoes on Tuesday (11/7) night at the Cabbage Patch with kickoffs at 6 and 8pm. In other results the men’s Reserve Grade an emphatic 5-0 win, Jack Martin a hat trick hero, Grant Homes 1 and the Shark 1. The women played Boambee Bombers who are current leaders of the women’s competition and went down 2-0.